Ideal for big and tall users; supports up to 350 lbs. Ideal for big and tall users. For use inside or outside. Tough and extremely durable, yet lightweight and easy to transport and store. Supports up to 350 lbs. Extra-wide seat pan and back are contoured for ergonomic comfort and resist dents and scratches. Big & Tall chairs stack six high for simple, compact storage. Easily wipes clean. Seat pan and back are made with blow-molded high-density polyethylene. Overall Width Maximum: 26" Overall Depth Maximum: 27"
Overall Height Maximum: 32" Seat Width Maximum: 24"
Seat Depth Maximum: 20" Seat Height Maximum: 18 1/2"
Seat Material: Blow-Molded High-Density Polyethylene Back Width Maximum: 24"
Base Material: Powder Coated Steel Tube Caster/Glide/Wheel: Non-mar feet. 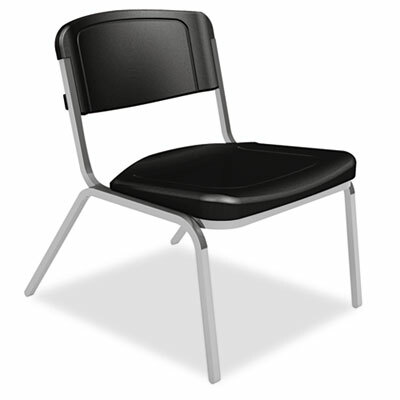 Seat Material: Blow Molded Polyethylene Back Width Maximum: 24"